It is dusk and haze hangs over the Ohio River as the wide serpent slithers into its den between distant mountains. I have an amazing view of the legend and its urban child, Wheeling, from Section A of Mount Woods Cemetery. The view makes me particularly grateful to still be on this side of the grass. 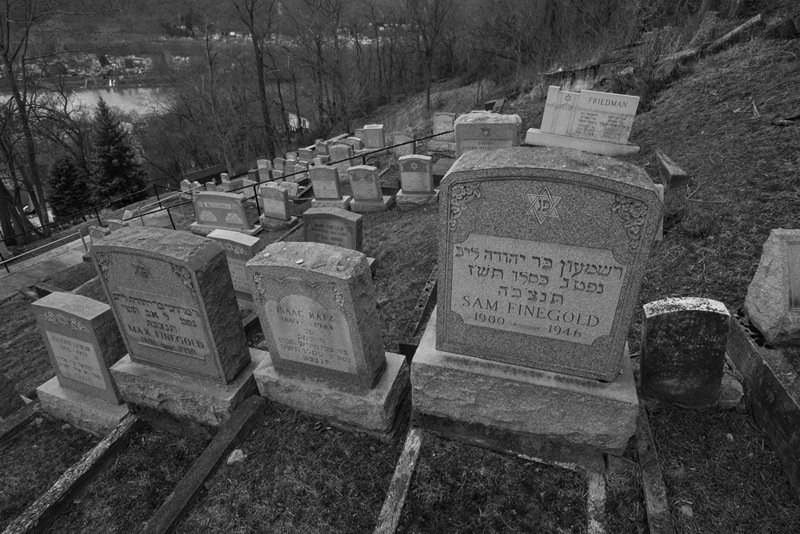 Adjacent to the Mount Wood Hebrew and Jewish Orthodox Cemetery, the rural cemetery is entrenched on Wheeling Hill, where Ebenezer Zane paused long enough to survey the landscape and declare that this place would become a land of promise. The valley, yes, but the hill was reserved for those whose promised land is just beyond the sunset. To enter this place you pass by a sign warning “Restricted Area Authorized Personnel Only.” I assume, by virtue of being a mortal, I am authorized to enter, and so I make my way up the patched road of sorrow toward the summit, past crumbling, fractured headstones, the stumps of oak trees and mausoleums inserted into the hillside. And I ponder the odd sign, wondering just what it means. 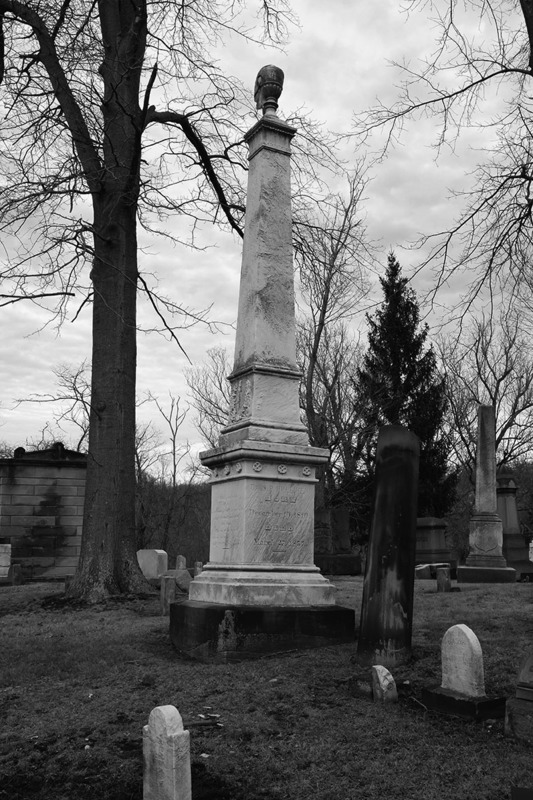 Mount Wood is an example of what was a national movement in the mid-19th century, the rural cemetery. 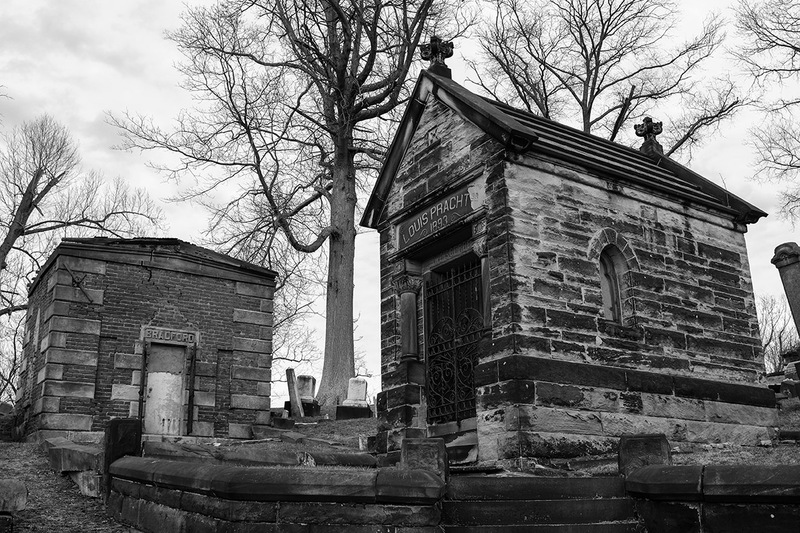 Replacing the crowded, urban-church graveyard, rural cemeteries featured carefully planned lots interacting with the natural beauty of the setting. The rural cemetery thus became both a place to mourn and find comfort, to listen to both the sermons in stone and songbirds in the boughs. Little has changed in the ensuing 150 years, but Mount Wood has a tired and battered look this March evening. For all the planning and planting, everything feels crowded, stilted and exhausted. Around the lower perimeter are the graves of the Jewish interments—the Finegolds, Katzes, Friedmans, Weissmans and Malts. The concrete rectangles that mark their graves lean toward the distant serpent, as if pulled by the river’s supreme authority over this land and all who would live and die upon it. 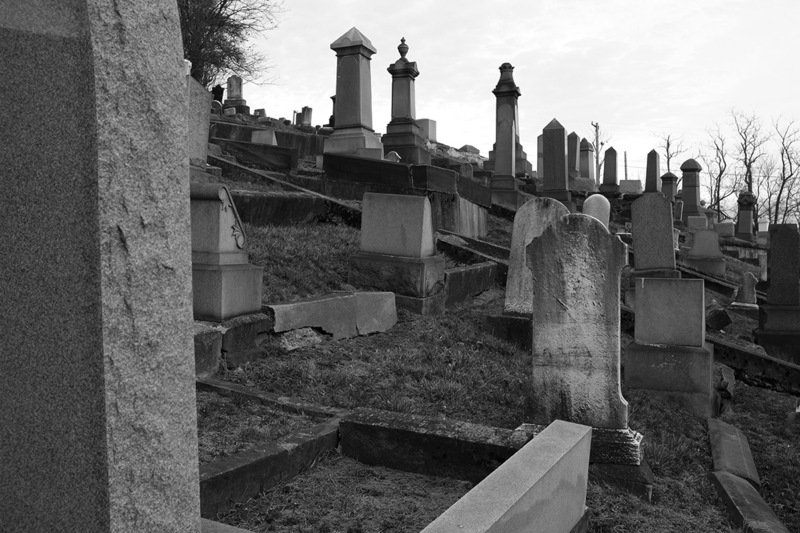 Graves are packed together so tightly one suspects the entire cemetery would slide into the river should just one corpse be raised at the final trump. Above the Hebrews’ graves rise the gaunt oaks, no doubt some of them among the 110 that were planted in 1933 in collaboration with Oglebay Park. It is unreasonable to expect even the mighty oak to withstand the buffeting winds, lightning and erosion of this exposed face. The living deciduous cell, no matter how noble, cannot survive in a place where stone erodes and concrete gives way to the forces of gravity, ice and time. On the summit, however, the sense security is stronger amid the towering obelisks, “white bronze” markers, marble stones and mausoleums. 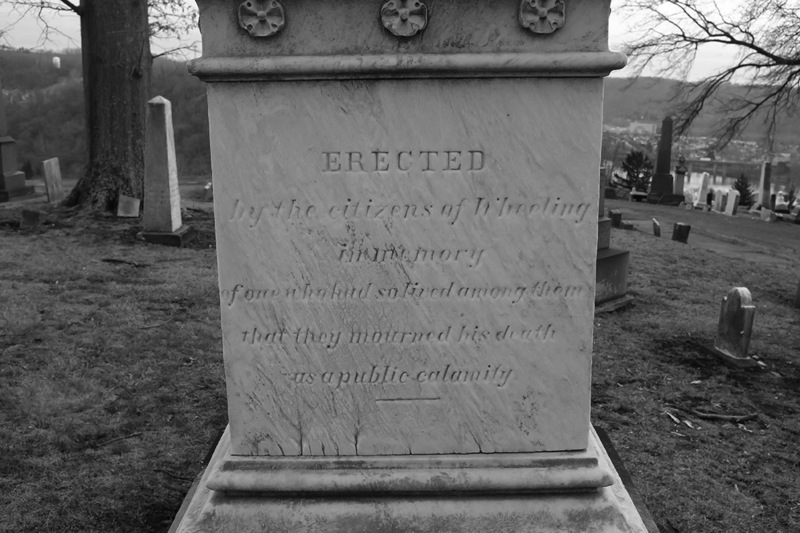 The trees are more numerous here, so too the graves of the affluent, the famous, the celebrated Wheeling citizens of the 19th century. Such distinguished company in which I stand: Eliza Hughes, the first female doctor to practice medicine in the new state of West Virginia; Col. Joseph Thoburn, a member of the First West Virginia Infantry and mortally wounded at the Battle of Kernstown; Noah Linsly, founder of Linsly Military Institute; Edward Norton, early city leader. “Eminent as a Surgeon the wide fame of his bold original genius was everywhere blended with gratitude for his benefactions,” states an inscription on one of the four base panels. Dentistry, in the days when Hullihen became a doctor, was not considered a profession and specialization was “tantamount to quackery.” Yet, in Hullihen’s time, he saw the Baltimore College of Dental Surgery open, and in 1843, he received an honorary doctor of dentistry degree from the school. His fame as an oral surgeon drew patients to Wheeling to seek his surgical intervention for defects of the mouth and head. He has been called the “Father of Oral Surgery,” and rightly so. Hullihen performed more than 1,100 operations in an era when “neither anesthesia nor asepsis were in use.” Patients with cleft palate, crossed eyes and damaged lips and noses were given new leases on life through his pioneering surgical methods. Because he was developing the specialty as he went along, Hullihen invented many of his own instruments, and the designs of some remain in use today. The growth of industry in the riverfront city brought with it many horrendous industrial accidents that required advanced medical care, but community leaders did not Hullihen’s demands for a hosptial. It was only after combining forces with the Roman Catholic Bishop of the Wheeling Diocese that Hullihen was able to see the city’s first hospital chartered in 1850. The haze becomes dusk, the veil falls upon the city and creates the illusion of down-river lights burning more brightly than before. The air at the lower elevation chills my skin and teeth as if death itself exhaled it. My old tooth tingles in the chill; I must remember to see the dentist soon. Very nice article and sorry about the wave. I wondered why no new items to read.